The SpaceShipTwo mothership WhiteKnightTwo took to the air for the first time on Dec. 21, 2008 following several weeks of taxi tests. VirginGalactic?s aim is to propel public spacetravel into reality. WhiteKnightTwo?sbuilders, the Mojave spaceport-based Scaled Composites, unveiled the spacecraftmothership on July 28, 2008. That rollout was followed by a Dec.21 maiden flight with another scurry into the sky taking place in early February. While thethird flight of the vehicle is close at hand, ?we never give a date in advanceas we only take off in light winds and generally good weather at this stage inan experimental program,? Whitehorn told SPACE.com. WhiteKnightTwo(WK2) will haul the suborbitalSpaceShipTwo spaceliner to a high-altitude release point. That spaceship,the first of which is nearing completion, has moved from drawings to hardwarethanks to the Scaled Composites work force under the watchful eye of the firm?sfounder, Burt Rutan -now Chief Technology Officer and Chairman Emeritus of the company. Roaring tolife via a hybrid rocket motor, SpaceShipTwowill carry two pilots and six passengers on a suborbital trajectory, scootingthe rubber-necking ?rush hour? commuters to the edge of space and returningthem to terra firma at $200,000 a seat. Whitehornsaid that testing of the WK2 carrier plane - christened ?Eve? in honor ofRichard Branson?s mother - has gone well. ?We nowhave just under four hours flying on WhiteKnightTwo and have now gone above18,000 feet,? Whitehorn said. ?We are very pleased with progress so far and itwould be fair to describe her performance so far as flawless,? he added. Theup-and-coming next test flight is set to raise the bar in altitude andflight-duration of the vehicle, Whitehorn said, among other items. For thosehungering for an up close and personal look at WhiteKnightTwo, best head forthe ExperimentalAircraft Association?s AirVenture extravaganza being held July 27-Aug. 2 inOshkosh, Wisc. Aftersuccessfully completing its initial flight test program, space launch vehicleVirgin Mothership (VMS) Eve is slated to make its ?world public debut? there onJuly 27. The spacelaunch vehicle will arrive as part of the opening-day air show. AirVentureattendees are being promised opportunities for up-close viewing of the vehicleon the ground each day until its departure flight as part of the Saturday, Aug.1 air show. Event organizers and Virgin Galactic officials are also scoping outadditional showcase flights during the week. Whitehornpointed out that VMS Eve is not only being designed to lift SpaceShipTwo. TheVirgin Galactic business case for space also includes unmanned satellite launchor doubling as a space science vehicle, as well as an astronaut training craft. 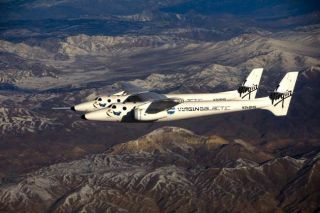 Accordingto Whitehorn, Virgin Galactic plans to conduct test flights of VMS Eve carryingSpaceShipTwo during the second half of 2009.